As I enter the building between Korea Foods Ltd. warehouse and its offices in the middle of the industrial state in New Malden, I can’t help but wonder if I am in the wrong place. Here, in a small office on the second floor, only recognizable by a laminated paper with “iFreeNK Office” typed on it, is where a newspaper about North Korea is published. And no, it is not run by the North Korean government. 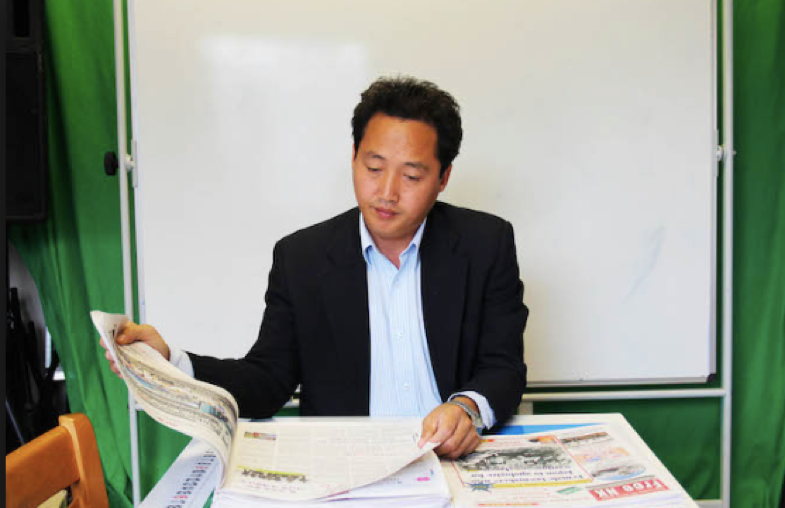 Mr. Joo-il Kim, a North Korean citizen, runs the newspaper with the help of fellow compatriots who, like him, fled their homes away from the oppressive North Korean regime in search of a better life. Joo-il Kim is 42 years old, born in Kilju, North Hamgyong province, North Korea, and now lives in New Malden, Surrey. He defected his country in 2005 and is a former Military Captain in the North Korean Army. Joo-il Kim is currently a human rights advocate and editor for iFreeNK. He is married with two children. His stance on politics? Democracy sets people free. Freedom is the basic pillar for individuals to decide their journey in life. Let’s start by talking about Juche ideology. How does it shape the regime system? Juche could be roughly translated to ‘self-reliance’. It means that one takes hold of one’s own destiny. Through this ideology, compulsorily adopted by the whole population, the North Korean government forbids any other religion, and intends to promote a society that can be self-sufficient. This society needs a leader; North Korea, therefore, needs the Kim dictators. This enables their absolute power and idolizes and glorifies the leaders. Is society still strongly divided in Songbun (North Korean caste system), and how does it determine the lives of individuals? To understand North Korea’s division system, we have to go back to the mid-1940s context. When Kim Il Sung first established North Korea, he advocated for a proletariat society where everyone is “ equal”. The initial point was to get rid of class and make North Korea a classless society. To make a “fair and equal society”, he created a system through which people of North Korea are classified. The class or caste system should favour the proletariat, and should win over the bourgeoisie class. He wanted to create an “equal” society through a new definition of class? Sighs. Exactly. In 1945 Kim Il sung came up with a revolution where the landowners, wealthy farmers, and anyone linked to the Japanese rule, labelled as “capitalists” , would get their land confiscated. This marked the start of Songbun (출신성분); the core class; leaders of the social revolution, known as the wavering class, who need education and embracement, but are subject to surveillance and have severe limitations in having successful careers; the antagonizing class were the people that needed clearing, through public executions or prison camps. This division resulted in a system where people are not judged by their talents and abilities, but rather their class. If you are wavering class, you have limitations in promotions; officials will exempt you from any possibility of becoming a leader in any way. If you are in the antagonizing class, crime by association linked to your ancestors takes away your basic human rights. In the past, if they didn’t repent on their previous faults in the people’s courts, such as being a capitalist or owning land, they would be subjected to executions or prison camps. Some didn’t even get the chance. Otherwise they become part of the hostile class which is pretty self-explanatory; life chances and conditions are so harsh that survival is an everyday challenge. Economic hardships have struck North Korea even harsher since the dissolution of the USSR and various periods of floods in late 1990s and early 200s. Does Songbun now remain as strong, or is it physically unsustainable? Class system hasn’t disappeared at all. People in power are still in power. Pause. The difference is that the people in North Korea are even poorer, and class cannot protect North Koreans from famine and misery anymore. And you? What was your role in society? We were supposed to be one of the lucky ones. My family and I used to be part of the core class; I was ascended to the position of Military Captain in the North Korean Army. Yet, we were extremely poor and lived in deep misery. Imagine what life is like for those belonging to a lower status. Seems like the cycle of poverty in North Korea knows no classes. I was taught that the proletariat should take over the bourgeoisie and that is why the class system was designed, so that the people in the bottom could become the people at the top. But as I was growing up I realized the state was not getting rid of a class system; it was overturning it, so that people who previously had less privilege now have all the power, whilst landowners or so-called “capitalists” became a class with no rights. There is something completely twisted in this system. Throughout your life in North Korea, have you seen any progress whatsoever, i.e. more freedoms, openness in markets? Or is the society stagnating and not moving forward? To be honest, everywhere in North Korea except Pyongyang is pretty much the same since the 1980s. Pyongyang has also benefitted from the advances in new technologies globally, but only a few people get to use these. I sometimes look up my hometown on the Google satellite and it looks exactly the same as it did thirty years ago when I was a child. There is no progress in terms of everyday lives of North Koreans, only from those at the top. Let’s talk about access to food …. In July 1st 2002 the rationing system was officially abolished, as the government could not afford to feed its people any more. The system changed from a so-called rationing system to a unique “salary system”, where people are given money to buy their own food. However, people working in the agricultural sector are technically still part of this rationing system. Otherwise, some food sectors are provided through the black market. How large is the black market in North Korea? Because the distribution system of the government is collapsing, and also very inefficient, people often turn to the black market. This sector, which acquires the label of “black market”, is known as a basic “institution”, and a means for survival! Officially it is how a normal market would function here, but because the state controls the number of items and what items can be sold, people still need the essentials. It also involves many other products that are banned by the North Korean government. North Korea has known several periods of severe famine. When this occurs do people place some of the blame on the government? In times of hardship, it is very rare for people to blame the government. Most people would say that famine occurs because of the Western Imperialism, especially America. The government places efforts to “brainwash” the population through education and propaganda, stating that the reason that people are suffering is because of Western intrusions in North Korea. Even as people starve to death, they are not able to recognize the government is to blame due to their isolation from the outside world, and lack of information besides the one given by the government. I wanted to ask about gender in North Korea. What is the state of gender equality in North Korea? North Korea is far from achieving gender equality. In July 30th 1946, the government passed a law called “ Gender Equality Law”, however, it has not been applied to people’s everyday lives. Why? Because the state limits women’s position in society, and within families there is a strong sense of patriarchy and women are seen as subordinate to men. This social atmosphere at home is created by North Korean politics. The Gender Equality Law from 1946 is used to contribute as propaganda to defend the “equality” status of North Korean Society. It is used in the Military Service, compulsory for both women and men, but it is also used for forced labour in Pyongyang construction sites. The conception of gender equality in North Korea is not the one we are looking for, as both men and women in society are subdued to forced labour rather than voluntary positions in the workforce. Besides all the obvious reasons stated above, what was the ultimate motive that made you defect North Korea? I first started to think of escaping when I joined the military. There was a huge discrepancy between the propaganda I had learnt at school and what the military was actually like. In school, I learnt that the military is the nation’s pride and protective of the North Korean people, working towards world peace. Instead, what I saw in the military was stealing, starvation, violence and people trying to escape. This made me very confused, and led me to think something was wrong with society. However, the definite trigger was seeing my own niece starve to death. What is the eventual goal of the newspaper iFreeNK? To smuggle iFree NK newspapers around North Korea, so people can have outside and objective information rather than the propaganda of the North Korean government. The people of North Korea have the right to know what is happening in the world. By providing these newspapers I want to give them the ability to be critical and think for themselves. My ultimate goal is to work for a free North Korea. Only freedom can liberate North Korea from suffering. What is it that you like the most about life in the UK? Freedom and democracy. But definitely freedom. I didn’t know what freedom was like back home. ‹ Is Brexit driven by the migrant crisis? › Should China let its currency float freely on the exchange rate markets?